The following report is one such account of a palatal swelling which turned out to be manifestation of an infrequent bacterial infection. A 33-year-old male patient reported to us with the chief complaint of a painless swelling involving right half of the palate for 5 years from the date of reporting. The swelling initially appeared as a small mass in the central palatal region and then grew over time to involve the entire right half of the hard palate [Figure 1]. The patient gave a history of being treated for RS which had manifested as a nasal swelling associated with chronic rhinitis 3 years back and reported a similar lesion at the same site 6 months back which was suggestive of recurrence. General examination did not reveal any deviation from the routine findings. Upon extraoral examination, slight facial asymmetry was noticed owing to the nasal swelling on the right side which resulted in obliteration of nasolacrimal fold. Intraorally, the lesion presented as an ovoid swelling involving the right side extending from the palatal area corresponding to right canine up to approximately 1 cm beyond the third molar and transversely from the gingival margins of the teeth till midline of the palate. The swelling was grossly 4 cm × 2 cm in size with regular, well-demarcated margins, and the overlying surface was smooth and of the same color as the adjacent palatal mucosa. On palpation, the swelling was nontender and soft to firm in consistency. Based on the history and clinical findings, a provisional diagnosis of palatal extension of RS was made. Minor salivary gland tumor, radicular cyst, and periapical abscess were considered in differential diagnosis. 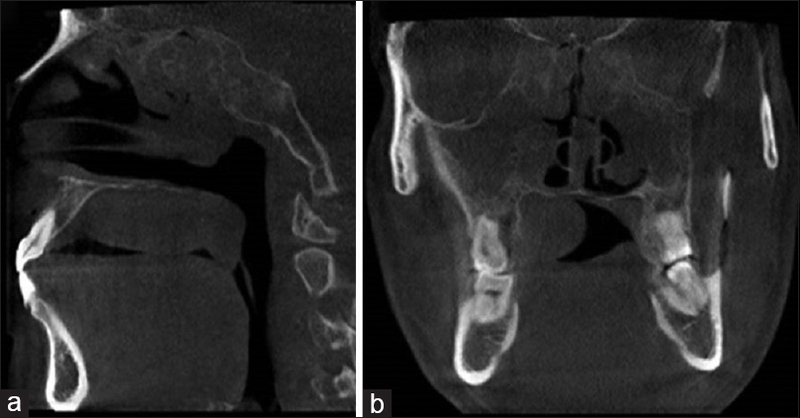 Subsequently, radicular cyst and periapical abscess were ruled out the due absence of any dental involvement. Pulp vitality test – The teeth were tested vital during the electric pulp testing. Radiographic investigations – The patient was subjected to radiographic investigations, wherein the panoramic radiograph was deemed insufficient to comment on the lesion and the patient was further advised cone-beam computed tomography (CBCT). CBCT revealed a palatal swelling appeared as an isodense mass on the right side of the palate measuring 37.4 mm × 20.6 mm in size. In the coronal section, radiopaque structures suggestive of the stents placed to correct the nasal obstruction were present bilaterally, around which soft-tissue masses appeared to grow. On sagittal view, areas of bone erosion were apparent in the posterior palate and floor of the nose indicating continuity in nasal and palatal lesion [Figure 2]. On hematological examination, the patient was found to have hypochromic microcytic anemia. Preanesthetic evaluation was conducted to rule out other systemic malfunctions such as diabetes mellitus and immunosuppressive diseases. Cytopathology – Cytological evaluation of the aspirate revealed clumps of red blood cells and few inflammatory cells. Microbial colony culture – No microbial colonies were observed after 48 h of incubation on MacConkey's agar. Incisional biopsy of the lesion gave the impression of a chronic granulomatous inflammation. Haematoxylin and eosin stained section exhibited fibrocellular connective tissue with severe degree of chronic inflammatory cell infiltrate with lymphoplasmacytic predominance and moderate degree of vascularity. Scattered at places were several large macrophages (foamy histiocytes) having a central nucleus and vacuolated cytoplasm with rod-shaped bacilli at places resembling the Miculicz cells (MCs). Also evident were hyalinized plasma cells which were seen either discretely (Russell bodies) or in clusters (Mott cells) [Figure 3]. Figure 3: (a) Scanner view shows dense fibrocellular connective tissue. (b) Russel bodies – Pale, homogenous, eosinophilic bodies representing excess immunoglobulin produced by the plasma cells (c) Chronic inflammatory cell infiltrate composed of plasma cells, lymphocytes, and foamy macrophages with centrally placed nucleus – Miculikz cells. Histopathology was consistent with the clinical diagnosis and further confirmation was done using special staining techniques to demonstrate the microorganisms. Gram staining showed the presence of Gram-negative rod-shaped bacilli. Periodic acid-Schiff (PAS) and Giemsa stain were also employed for demonstration of the Klebsiella spp. The organisms were stained magenta with PAS and light blue with Giemsa stain [Figure 4]. Based on the histopathological findings, the diagnosis was given in favor of RS. The patient was referred to the department of Ear–Nose–Throat surgery for further treatment. The lesion was surgically excised and antibiotic therapy with tetracycline one gram twice a day along with Ciprofloxacin 500 mg/day for 1 month was started and continued as deemed fit by the physician. No recurrence has been observed up to the 6-month follow-up. The patient is kept under regular observation to monitor any incidence of recurrence. RS or scleroma is a rare, chronic, indolent, granulomatous, and debilitating bacterial disease primarily involving the nose and is designated as respiratory scleroma when it involves subglottis, trachea, and bronchi. Its notoriety in involving other neighboring sites such as nasopharynx, Eustachian tube More Details, paranasal sinuses, soft tissues of lips and nose, and rarely orbit is well established. The current case is one such example of extranasal RS. Anton Von Frisch in the year 1882 is credited with the identification of the causative organism K. rhinoscleromatis, a Gram-negative aerobic bacteria belonging to the Klebsiella pneumoniae family., RS has female predilection (13:1) and usually occurs in the middle-aged population. Low socioeconomic status, malnutrition, and iron deficiency anemia are considered as the predisposing factors that lower cellular immunity while preserving humoral immunity.,, The presence of HLA-DQA103011-DQB0301 haplotype has been found to be a strong risk factor. In our case, the patient reported with a palatal swelling and involvement of the posterior part of the oral cavity which differed strikingly from its usual manifestation like nodular enlargement observed in the lower nasal and upper labial region. In 1969, Mikulicz and Woyke et al. described the microscopic picture of the disease along with the first description of the ultrastructure of granulation tissue in RS. Microscopic deduction shows an initial infiltration of neutrophils, plasma cells, and macrophages which is followed by granulomatous inflammation, characterized by numerous plasma cells along with Russell bodies and MCs. Russell bodies, which represent excess immunoglobulins produced by the plasma cells, are round to ovoid, homogeneous, eosinophilic, and up to 40 um in diameter. MCs are large phagocytes with a single shrunken nucleus, displaced to the cell periphery because of the presence of multibacillary cytoplasmic vacuoles, 10–100 um in diameter.,, In adjunction to the routine histopathology, various special stains have also been employed in detection of the K. rhinoscleromatis, these include PAS stain that stains the bacilli pink, Giemsa stain which gives pale blue color to the organism and Warthin–Starry silver stain which imparts a distinct black color to the bacilli making it more prominent as compared to the previously discussed stains. Recent advances in the diagnosis, in conjunction with the existing methods, include serotyping and immunohistochemistry. De Pontual et al. in their study noticed seropositivity in culture for O2:K3 type of Klebsiella. Noninfectious conditions – Wegener's granulomatosis, natural killer cell lymphoma, lethal midline granuloma etc. The fungal etiology may be ruled out by the negative culture of the causative organisms as well as by applying the special stains such as PAS, Gomori Silver Methenamine to demonstrate the fungal hyphae. Presence of acid–fast bacilli is the diagnostic feature of other granulomatous infectious diseases such as Tuberculosis and leprosy. Efared et al. in 2017 applied immunochemical histiocyte staining for CD68 to rule out the diagnosis of certain lymphomas or malignancies which may mimic the morphology of RS. Routinely followed treatment for management of RS includes surgical correction and antimicrobial treatment with ciprofloxacin, streptomycin, rifampicin, sulfonamides, clofazimine, or fluoroquinolones. Treatment must be continued for months, which frequently leads to poor patient compliance. Recurrence is quite common in cases of RS and its chronicity also plays a pivotal role in unsatisfactory prognosis of the disease. RS usually presents with very deceptive clinical features which often may lead to its misdiagnosis. This report presents one such incidence of this disease with widespread involvement including oral cavity. In this scenario, histopathology has proven to be an excellent aid in clearing the dilemma surrounding the diagnosis of the condition. Currently, newer advances in the diagnosis by serotyping and immunohistochemistry are being explored which will lead to more prompt diagnosis thus resulting in better prognosis. We are grateful to Dr. S. P. Dange, Dean and Professor, Department of Prosthodontics, for providing with the palatal prosthesis during the course of management. Rajendran R. Shafer's textbook of oral pathology. Elsevier India; 2009. Bhagyalakshmi A, Rao CV, Krishna Kishore T, Kartheek BV. Rhinoscleroma: A case report. Int J Case Rep Images 2014;5:868-72. Nayak P, Pramod RC, Suresh KV, Desai D, Pandit S, Ingaleshwar PS, et al. Rhinoscleroma of nose extruding into oral cavity. J Coll Physicians Surg Pak 2015;25 Suppl 1:S27-9. Basavannaiah S. Unusual presentation of rhinoscleroma mimicking midline granuloma: A histological surprise. Int Res J Clin Med 2016;1:13-7. Efared B, Hammas N, Gabrielle AE, Ben Mansour N, El Fatemi H, Chbani L, et al. Rhinoscleroma: A chronic infectious disease of poor areas with characteristic histological features – Report of a series of six cases. Trop Doct 2018;48:33-5.
de Pontual L, Ovetchkine P, Rodriguez D, Grant A, Puel A, Bustamante J, et al. Rhinoscleroma: A French national retrospective study of epidemiological and clinical features. Clin Infect Dis 2008;47:1396-402. 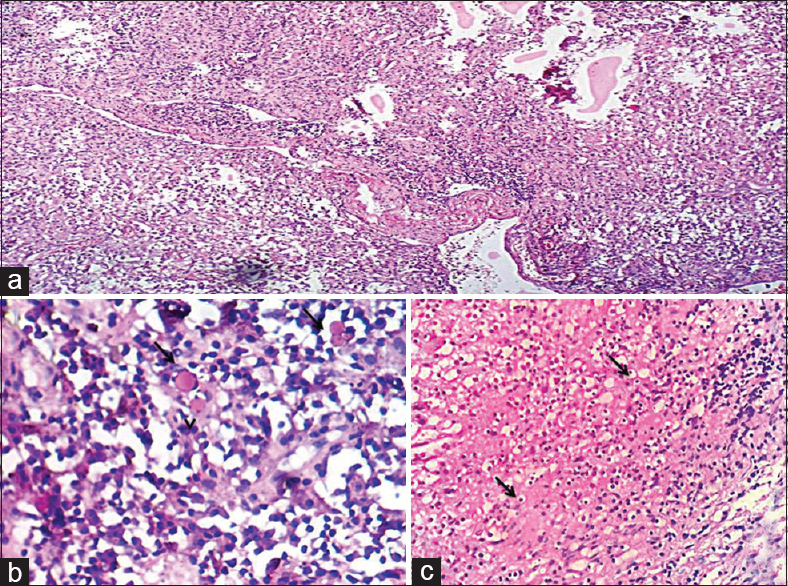 Suresh J. Antony rhinoscleroma: A look at an unusual fascinating disease from the tropics. Review of the literature and report of 2 new cases. Immunol Infect Dis 2014;2:30-2. Gnepp DR. Pathology of the Head and Neck. Churchill Livingstone; 1988. Corelli B, Almeida AS, Sonego F, Castiglia V, Fevre C, Brisse S, et al. Rhinoscleroma pathogenesis: The type K3 capsule of Klebsiella rhinoscleromatis is a virulence factor not involved in Mikulicz cells formation. PLoS Negl Trop Dis 2018;12:e0006201. Linke M, Pham HT, Katholnig K, Schnöller T, Miller A, Demel F, et al. Chronic signaling via the metabolic checkpoint kinase mTORC1 induces macrophage granuloma formation and marks sarcoidosis progression. Nat Immunol 2017;18:293-302. Marx RE, Stern D. Oral and maxillofacial pathology. Chicago: Quintessence. 2003. Abalkhail A, Satti MB, Uthman MA, Al Hilli F, Darwish A, Satir A, et al. Rhinoscleroma: A clinicopathological study from the gulf region. Singapore Med J 2007;48:148-51. Patel N, Bohra C, Gajanan G, Sandil RL, Greene JN. Palate Perforation – Infectious and noninfectious causes. Infect Dis Clin Pract 2016;24:83-6.